On Sep 24, anniversary of the first professions of the Society of Mary, Mrs Lillian Richards died peacefully at Umina Park nursing home in Burnie, Tas. Marist Fathers and Brothers across the Australian Province mourn her passing as the great lady of the pioneer Marist days in Tasmania's north-west. Attending tirelessly to a multitude of needs of the fledgling Marist parish and college foundations at Burnie, Lill was awarded the singular honour of affiliate membership of the Australian Province on Apr 21, 1986. The certficate inscription reads: 'Mrs Lill Richards. We welcome you to honorary membership of the Society of Mary in recognition of your outstanding contribution to our Australian Province.' It is signed by then-provincial, Fr Garry Reynolds SM. One of Lill's grandchildren is Fr Kevin Redmond SM, presently on the teaching staff of St John's College, Woodlawn, Lismore, NSW. web site address is www.maristfathers.com. Above right: Fr Gil Casio on the Maera Moo River as part of TOH 2005. Hours after the Oceania Marist Province's refreshed web site was launched on Sep 23 (see below, 'Download your blessings'), another partner unit of Marist Asia-Pacific went online. Developed by webmaster, recently-ordained Fr Gil Casio SM, the first web site of the Marist Philippines Mission District commenced on Sep 24, anniversary of the first professions of the Marist Fathers in 1836. Fr Gil is known to Australian Marists and friends through his 2005 participation in 'The Other Half' experience, sponsored by Marist Mission Centre Australia. His is pictured (left, in blue shirt) in the now-famous photo on the river to Mae La Oon refugee camp on the Thai-Burma border. On Sep 21, Fr Patrick Kervin SM celebrated twenty-five years of Marist priesthood. Some days later family, friends and fellow-Marists gathered at St Patrick's, Church Hill, in Sydney's 'Rocks' area to celebrate the occasion. Since seminary formation at Toongabbie and Hunters Hill, Fr Pat has execrised a variety of ministries including secondary school teaching (Woodlawn College Lismore NSW, St Paul's College Bellambi NSW and Marist College Burnie Tas) and parish work at Burnie, Tas. Hospital chaplaincy and renewal periods in Rome and Washington have preceded his appointment at St Patrick's. The silver jubilee event coincided with the birthday of Fr Pat's mother, Joan Kervin, and two cakes were cut in the celebrations after Mass in the crypt of St Patrick's. Left and below: Images of Fr Pat's jubilee celebration, including Marist concelebrants and the post-Mass gathering in St Patrick's crypt. It was in 2007 on the feast of the Holy Name of Mary that the Aquinas Academy received word from the Marist General Administration in Rome approving the purchase of a place of solitude and silence. of the close links between the Marist Fathers and the Sisters of St Joseph. In Sep 20 2009 about fifty people joined Bishop Kevin Manning of Parramatta for the blessing of the property originally owned bt the Patrician Brothers. There are two cottages on the property, one is called “La Neylière” in recognition of this important site in Marist history, the other is called “Mary MacKillop Hermitage” in recognition of Mary MacKillop as an important person in the history of the Gospel in Australia. 'Mary MacKillop Hermitage' is now available. It provides individuals with times of solitude and silence. A small resource library with books, CDs and DVDs assists with prayer and reflection. The cottage has all modern conveniences. or contact Aquinas directly: secretary@aquinas-academy.com or call on 02 92474651. Views of 'Nazareth' include ongoing ground work by Sr Marie Biddle RSJ (on the tractor) and Fr Michael Whelan SM (battling the lantana) as view of Mary MacKillop hermitage. The Marist Oceania Province has marked the updating and upgrading of its web site with a ceremony at Marist College, Suva, Fiji, on Sep 23, Fr Leronio Vodivodi SM led a modern prayer of blessing on the new site. The date for the launch was inspired by the anniversary of religious profession of the first Marist missionaries for Oceania on Sep 24, 1836. Rector, Fr Suni Halapio SM, doubles as webmaster and vicar-provincial of the Oceania Province. Luckily a number of his seminarian-students are able to assist in the new task of launching into today's world of social media. The Australian Marist Province has supported the project with skill development, hardware and software as part of the Marist Asia-Pacific (MAP) program. Fr Leronio Vodivodi SM leads the blessing of the web site / students of Marist College at the launch. The Marist Mission Ranong (Thailand) was represented recently at Caritas Australia's workshop on international development. Mission director, Kiwi Fr John Larsen SM and Filipino Marist, Fr Kevin Medilo SM, shared their experience of the first mission of the Society of Mary on mainland Asia. Working amongst Burmese migrant workers in Ranong's fishing industries, the mission now ministers to hundreds of poor families through education, social welfare and health care including the increasing numbers of HIV-AIDS afflicted persons in the region. See Marist Mission Ranong. Provincial of the Marist Fathers' Australian Province, Fr Paul Cooney SM, leaves Villa Maria monastery on Sep 18 to participate in the international finance committee meeting of the Society of Mary. Other committee members are Fr John Murphy (NZ) and Fr Ted Keating (USA). The meeting will take place Sep 22-24 at the Marist General House, Monteverde, Rome. Bursar-General, Fr Kevin Mowbray, will present a report to the Committee whose tasks include advising the General Administration on a wide range of financial issues. Fr Gerard Hall SM was recently guest speaker at the Queensland Intercultural Society and during the ensuing dinner received the society's 2010 award for 'Building Bridges especially between Catholics & Muslims'. Fr Gerard is Associate Professor in Theology at Australian Catholic University's Brisbane campus. 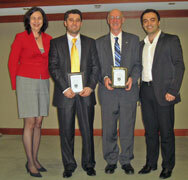 Another recipient, Murat, a Muslim, is pictured (far left) with Fr Gerard and Society officials. Also pictured is Fr Gerard in 2007 with indigenous leader, Aunty Joan, and the late Raimon Panikkar to whom Fr Gerard attributes many insights into intercultural dialogue. 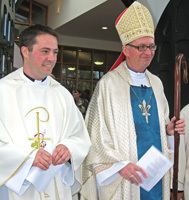 Auckland's Bishop Patrick Dunn ordained Matthew Crawford SM (35) in his home parish church of St Francis Xavier, Whangarei, NZ, on Sat, Sep 04. 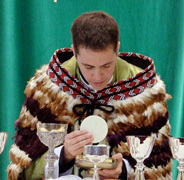 Fr Matthew celebrated his first Mass the next day at Whangarei, presiding at the monthly Maori Mass (first Sunday of the month) where the celebrant traditionally wears the 'korowai', a cloak of feathers. Before his ordination Matthew spent a two-year pastoral period working in poor areas of Mexico before a diaconate period at St Mary of the Angel's city centre, Wellington, NZ. 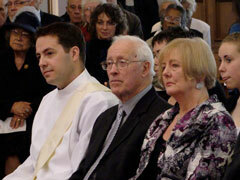 During 2004 Matthew spent his novitiate year in Ermington, NSW, and was professed as a Marist on Jan 01, 2005. Over the summer of 2005-06 Matthew was amongst the group of Asia-Pacific young people participating in 'The Other Half' (TOH) experience hosted by the Australian Province's Marist Mission Centre. The TOH journey took Matthew and his companions into refugee camps on the Thai-Burma border and to HIV-AIDS and disabled youth projects in Thailand and Cambodia. Left: Fr Matthew Crawford with Australian Marists, Frs Tony Kennedy and Kevin Redmond. 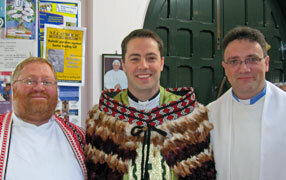 Frs Matt and Kevin are the youngest Marist priests in the NZ and Australian provinces. Right: Matt Crawford and TOH-ers in Thailand, 2005. Scenes from the ordination and first Mass, including Fr Matthew with his parents; also NZ Marist Provincial, Fr Brian Cummings SM, laying hands on Matthew during the ordination. Forty years after initial support from Australian Marists, Bangkok's Human Development Program has received royal recognition in Thailand. In the early 1970's Fr Peter Guiren SM visited Bangkok and offered assistance for the fledgling Redemptorist mission in Thailand. HDF's founder, Fr Joe Maier CSsR, acknowledges the Australian Marists as the first to back the American missionaries in the Klong Toey slum district of Bangkok. On Sep 02 HRH Princess Srirasmi visited HDF's Mercy Centre in Klong Toey in recognition of the newly awarded status of the foundation. During her visit the princess unveiled a plaque signifying the foundation's new status. HDF currently cares for one hundred and eighty abandoned, abused and orphaned children who go to school and live as family in the foundation’s Mercy Centre. Fifty-seven of these children were born with HIV. The Foundation also runs twenty-four kindergartens teaching and feeding almost four thousand children daily. HDF's legal aid project represents one hundred children a month in police stations and children’s court.